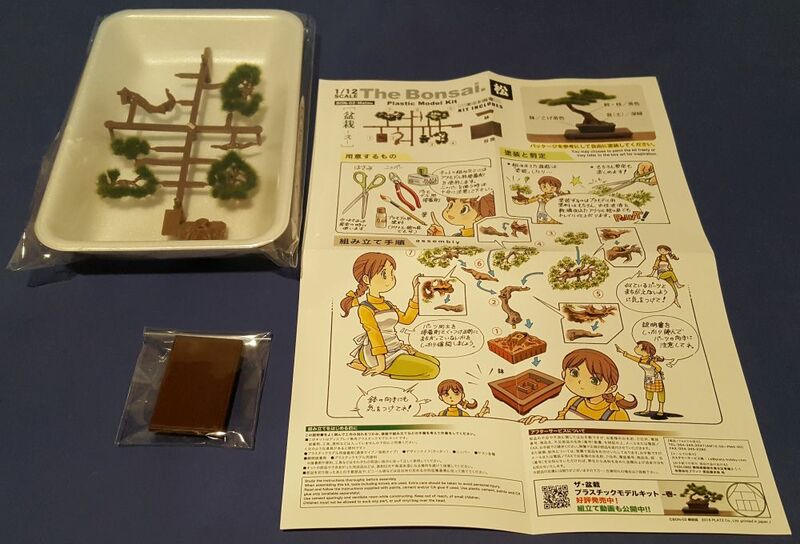 Out from Platz is this 1/12th scale plastic Bonsai tree labeled as BON-02: Matsu. Unlike BON-1: Matsu, BON-2 is a single trunk tree where BON-1 is a single tree split almost into two trees. 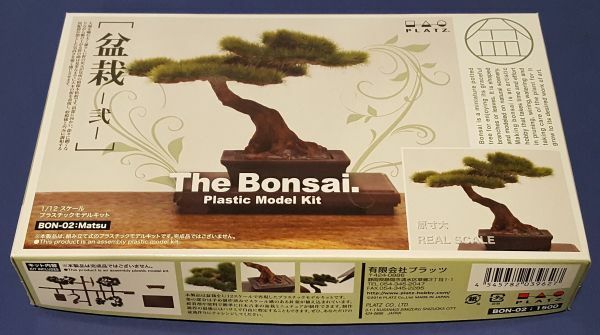 This kit comes with full color instruction sheet which is in japanese but very easy to follow with some information about Bonsai trees on the back. This kit also has nine parts which the greenery is already attached to the branches and the kit parts are protected in a styrofoam tray. Also the kit comes with a traditional planter and a table for the perfect way to display when completed. This kit is perfect for making 1/12 scale dioramas of traditional Japanese houses or garden art. The only down side to this kit is at a first glance this looks like a great kit, but there are no painting instructions. At the top of the instruction sheet it says "You may choose to paint the kit freely or may refer to the box art for inspiration". The Box cover has one good size picture on top and three small but detailed pictures on the side. On the plus side the greenery does not come pre-trimed so you can trim it the way you want just like the real Bonsai tree and you don't have to water it, but be careful because unlike the real tree, it does not grow back if you trim it wrong. Our thanks to Platz for the review tree.